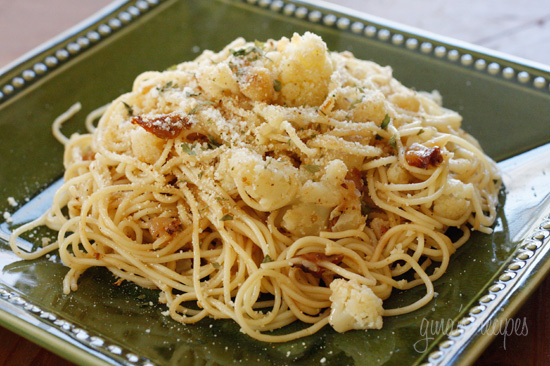 Pasta with cauliflower, toasted bread crumbs, cheese and a mysterious ingredient… anchovies. You don’t think you like anchovies? Don’t leave them out! They really give this simple dish a wonderful savoriness, not fishy at all. You’d be surprised how many of your favorite Italian dishes have anchovies in them. This recipe was adapted from my Sicilian friend Julia, from Julia’s Healthy Italian Cooking. She has a gift of whipping up delicious Italian meals in minutes! For a gluten-free option, use brown rice pasta for 8 points plus. Boil pasta in salted water according to directions for al dente. Drain pasta, reserving 1 cup water. Meanwhile, steam cauliflower (or boil) until tender. Set aside. Add 1/2 teaspoon of oil to a small frying pan and toast breadcrumbs, careful not to burn. Set aside. In a large frying pan sauté anchovies in remaining tablespoon of olive oil until they begin to dissolve. Add onions and cook on medium heat until golden. Toss pasta with parsley, cheese, cauliflower, 1/2 cup of reserved pasta water, (more if needed) and season with salt and pepper to taste. Divide evenly between 6 plates. Top with toasted bread crumbs and serve. Just made this and I think it was pretty good. I used roasted cauliflower instead of steaming it, and I thought the cauliflower was more flavorful this way. I felt the pasta was a little dry even after doubling the pasta water. I would definitely try this again with the suggestions of adding garlic and red pepper flakes. Gina, couldn't wait for the reply so I made this dish last night..It was very delicious..wasn't fishy at all, you could barely feel the taste of the anchovies..Couldn't find the Pecorino Romano so used Parmesan cheese instead. I have also reduced the quantity of the pasta a bit. It was really great..Definitely a Keeper! 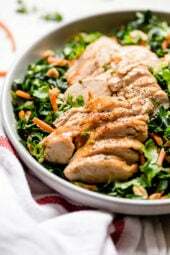 This is officially my favorite healthy food blog..Keep up the great work..
Gina, I couldn't find Pecorino Romano, any suggestions as a substitute? I made this tonight for my family. I was skeptical about the anchovies but it was delicious and my 10 month old gobbled it up! I found the anchovies did leave a little fishy taste but it wasn't strong. I love the idea of using garlic instead and maybe just a dash of anchovy paste! Thanks again Gina, you are helping me make a little foodie of my baby girl! Oh wow, my Sicilian grandpa used to make a similar dish, just used broccoli instead of cauliflower, it's soooo yumm. I never thought that I would find a similar recipe on such a traditional (and rural) Sicilian dish. For those who don't like anchovies, you can use garlic instead. it gives the pasta a really nice flavour. When you toast the breadcrumbs in a skillet, add finely chopped garlic and mix well. 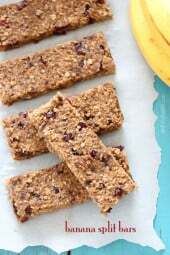 continue as shown in recipe. My mother in law makes this dish and she cooks the cauliflower first,sets it aside and uses that water to cook the pasta. If I use anchovy paste how much would be equivalent to 5 anchovies? Would making it without the anchovies (I just can't bring myself to eat them), change the points value? Made this for the first time last night. I added 3 cloves of chopped garlic and a good dose of red crushed pepper flakes at the same time I put the onions in (and skipped adding any salt and pepper at the end). SO good. I made this yesterday and it has a really great taste to it!! sooooo good. I think next time I will be putting big chunks of garlic in it, I felt like that was the only thing really missing….but this is a goodie!!! Whole anchovies are so much better than the paste. I find the paste to be bland. Try it with whole next time, and use all 5. I made this dish yesterday. I found it to be a bit bland. I used anchovy paste…maybe not enough. I will try it again using the amount you suggested (2-3inches) above. FYI, for those that are afraid of anchovies, I don't like them on their own either, but they definitely add much taste to recipes. So good! I made it tonight and am having the leftovers for lunch tomorrow. Comes in a small glass jar, check the supermarket. They also sell anchovy paste which comes in a tube you squeeze out. That would work too. I've never bought, eaten, or cooked with anchovies before. I'm up for trying this dish but I don't know where to purchase anchovies. Can I find them in a supermarket? Are they canned? I have no idea. Delicious. I roasted my cauliflower and added some red pepper flakes just to spice it up. A definite repeater in our house! I think gluten-free pasta is more points, but I don't think it's any healthier than wheat pasta, just better for those who can't eat gluten. Just out of curiousity, why would gluten-free be more WW PointsPlus? Aren't gluten-free products less processed and healthier for you? In my traditional family version of this dish, small chunks of romano are sauteed with the breadcrumb topping. Th e same breadcrumb mixture is used to stuff artichokes……. this was delicious.. I made it like the recipe says above for me and for my skinny minny hubby I added some sweet italian sausage. He loved it as well. Brandi, I don't think it effects the points per serving. I'm going to make this tonight and was wondering if the Bread Crumbs have to be whole wheat (couldn't find that kind in the store)… If not, will it mess with the points plus at all? Last night was the second time making. It is quick to make under 30 minutes and delicious. My daughter loves the white broccoli. I think you have to like cauliflower to enjoy this. I love it!! Hi Ginny, guess what, tomorrow night it is this menu. I love ur site. This is just what i needed. All ur receipes look so good. Keep um coming. Could u imagine, not having to hurt your head about what to cook for breakfast, lunch, snack or dinner. I love it. I made this tonight and it wasn't one of my favorite dishes. I don't think the recipe was lacking anything. I just think it wasn't my type of meal. I'm going to try this one tonight! I love cauliflower but struggle with various ways to incorporate into my recipes! Third recipe from this site this week and it was another hit!!! So tasty. I was scared of the anchovies but the flavors were amazing. YUMMMMMM!!! So so good! my husband added some chicken for protein and it was wonderful! We made this and it came out really bland, I'm not sure what we did wrong. 2-3 inches should do it. If you are using Anchovy paste instead how much do you use? I promise!!! Break them up small while they cook. Just made this tonight, I used anchovy paste and I roasted the cauliflower. It was absolutely delicious. Michelle, I bet garlic and red pepper flakes would be delicious! And yes!! Good cheese is a must!! The kind from the can is not an option. Just made this recipe- so good and filling!! Thank you for sharing. I lived in Sicily for 3 years, and this is one of my favorite recipes that I learned while there. The anchovies truly make the dish! Sicilians use broccoli and cauliflower interchangeably, so cauliflower haters have another option. For more flavor, try adding some minced garlic and crushed red pepper flakes. Also, make sure to use a high quality cheese. No powdered junk out of a can! I like to use a mix of Pecorino and Parmigiano cheeses. This just looks devine! I love cauliflower, not a huge fan of anchovies, but I know what you mean about it adding the savory factor. I will have to give this one a try! if you dont use the anchovies does it lower the points+? 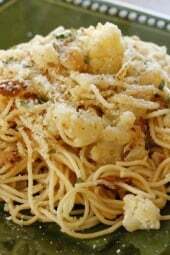 I love pasta with cauliflower! This looks like a particularly tasty version. 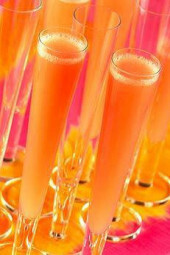 It looks delicous can't wait to try it!! Great recipe! I am a huge fan of cauliflower, so I will have to make this soon! 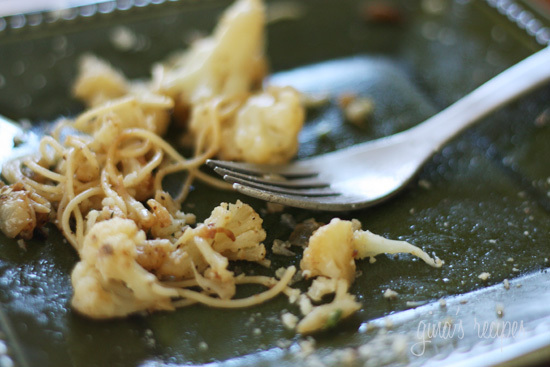 You can use anchovy paste if you prefer, roasted cauliflower would be delicious! That looks so good! I LOVE cauliflower! This sounds delicious! I might try it with roasted instead of steamed cauliflower. I love cauliflower but don't eat it that often! I should defiantly try this out! This looks delish! I love your recipes. Will you please just come live at my house and cook for us every day? This sounds great. Would anchovie paste work instead of whole anchovies? I have an irrational dislike of cauliflower (I can't get past the idea that I think it tastes like mold) but I really like the simplicity of this pasta topping. Could you suggest an alternative vegetable? Or is it better left alone? You could use broccoli or zuchini. I love raw cauliflower but hate it cooked so this is the alternatives I would try. I had to cut back on the olive oil to keep the points down, but this is really a lovely dish. I made a very similar dish a few weeks ago. We all loved it. My daughter fought us for the left overs. I like your idea to use whole wheat spaghetti. I will try it next time.